We don't use weed killer on our farm. At least, we don't use the kind that comes in a jug from the store. Our weed killers tend to be the four and two legged kind. The cattle, laying hens, chickens and turkeys. Pigs graze too, given the opportunity. They love to eat grass and to eat the roots too. They will dig out a hole in no time and strip the ground clean. When the pigs appear in spots they are not supposed to be in, it is time for the farmers to clear along the electric lines. By August, the grass and weeds have grown up high around the electric lines, and the lines get shorted out. They stop working because the electric current is no longer circulating through the wires. This happens next. 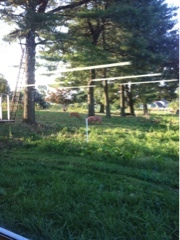 Pigs in the back yard, no longer in the paddock where they were supposed to be. Meeting the farmer at the door of the truck. Out come many methods of getting the electric line working again. And keeping every animal where they are supposed to be. But not the weed killer in a jug. It kills a little more than we want.